Filipino cuisine is said to be among the most flavorful ones in the world. And while we have a lot to be proud of in the taste department, we often forget that our dishes can be healthier, too. In this article, we delve into the healthier side of lutong Pinoy. This famous, easy-to-prepare dish perfectly combines the sourness of vinegar and the saltiness of soy sauce. For a healthier twist, you may opt to use the low-fat protein chicken instead of pork. You can also add Del Monte Pineapple for added Vitamin C.
Another all-time favorite in every Filipino household, the kare-kare may not be the same without the beef tripe or tuwalya and the oxtail or buntot. 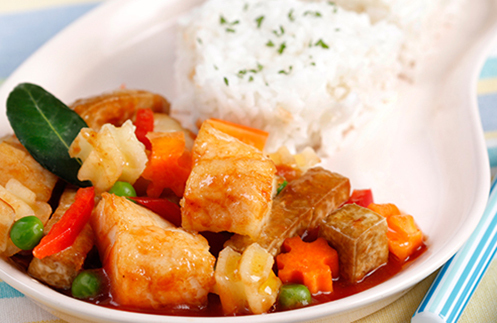 A healthier way to prepare the dish is to try cooking Seafood Kare-Kare or Tofu Vegetable Kare-Kare. These alternatives still give you the same taste and nutrition minus the fat-laden meats. In his blog, Archie talked about using milkfish or bangus instead of the usual pork for a healthier version of sinigang. For those who really like pork though, Del Monte has a tastier lycopene-rich version. Check out Del Monte Kitchenomics to get the Del Monte Red Sinigang recipe. Experimenting on how you can make your favorite Filipino dishes healthier is, without a doubt, fun. Don't hesitate to explore your options and remember the basics of the ingredients you will add to (or remove from) the dish that you will prepare. Fruity and Delicious Temptations for Kids!